A scoreless first half from Balwyn. Saw Pascoe vale score 4 goals giving them a good lead going into half time. Pascoe vale ability to read the play and find space and time when going forward was the reason they were able to find the back of the net. Balwyn had their chances on the counter attack but wouldn’t able to score. Their keeper was under pressure from the start and blocked as many shots as she could. Communication amongst players was very minimal but both coaches were making their voices heard. Informing players to press and spread. To find their players and shoot. Second half under way and Balwyn were able to finally get some reward for effort and find the back of the net getting one goal in the game. Pascoe vale went on to score another five goals in the second half make it too hard for Balwyn to come back from. First half under way and both clubs press hard. Presto able to get the first two goals early. To give them some breathing space and an early lead. But Western Wolves didn’t give in. Continuing to find space and shoot and that ability kept them in the game. Western wolves were able to get to late goal in that first half to level out the game going into half time. With five minutes remaining a time out was called giving both teams a breather and time to re think their game plan. Scores level at half time. Second half starts and play resumes. Both teams with one goal in mind and thats to get the first goal of the second half to put the pressure on the other team. Western wolves certainly do that. Get two quick goals and put the pressure on Preston. Both keepers kept busy with shots taken at both ends. Preston were able to go forward but couldn’t find the back of the net. Western Wolves went on to score four goals in the second half. Preston left confused and wondering how they let the early lead slip away. Goal after goal after goal scored in the first half. Fitzroy able to have most of the possession in the first half and that helped them when going forward finding time and space. They were able to have continuous shots on goal. Seeing them score seven goals in the first half. Melbourne amazon kept scoreless in the first half and their defensive structure and tactics struggled to handle the heat that Fitzroy put on them. They were able to find some counter attack space that allowed them to a 3 shots on goal but couldn’t get that reward for effort. Second half under way and Amazons need to lift and improve from the first half. They aim to at least make it on the scoreboard and score. Fitzroy get the first goal of the second half. With eight minutes remaining in the second half time out called giving both teams a breather. Allowing Melbourne a time to chat as a team to work out where they are going. Fitzroy respond with a goal, a minute later again able to find the back of the net. With under a minute remaining Fitzroy able to find their 11th goal of the game. A massive game for both sides with an SFA spot on the line, and it was as tight as we expected with both sides peppering at either end but could not find the net. A time out called by Moreland late in the half paid off, as they opened the scoring through an Ebru Hassan strike to give them a slender lead going into the half time break. Moreland upped the tempo in the second half and added another three goals early on through newcomer Nikolina Bucolo, a second for Hassan and another from Bucolo set up the game nicely for the Blues, with Alexandra Gummer instrumental playing a part in three of the first four goals. Carlton continued to battle and pulled one back through Rebecca Davies, but it wasn’t going to be enough with Moreland continuing to apply the pressure and adding to their lead as Ella Mastrantonia got herself a goal from range, Hassan turned well as a target and finished completing her hat trick. 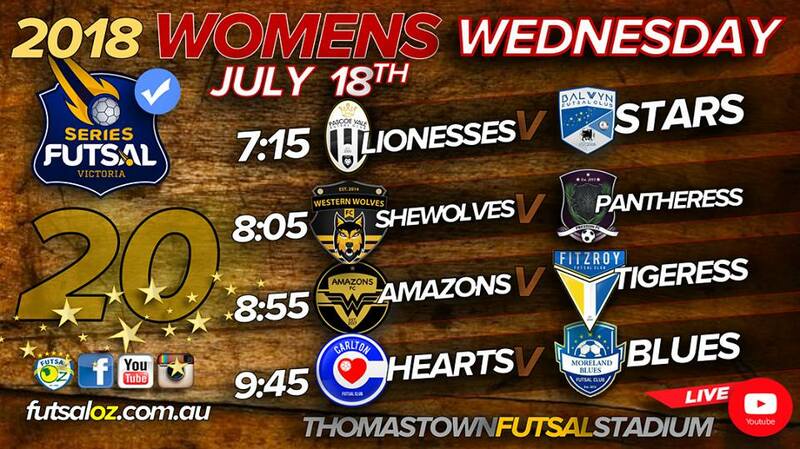 Mastrantonio would add a further two goals to her tally to bring up a hat trick and seal a convincing win for the Blues as they all but book their place at Series Futsal Australia, while Carlton are left to hope for a wildcard.